IoT-enabled asset tracking and monitoring solutions, such as SenseIT IoT by Domain, are at the core of how successful businesses are reducing product damage and theft, saving time and money, improving operational efficiency, and delivering superior customer service. Domain Consulting Group, located in Wyomissing and Philadelphia, PA, is an SAP consulting company that helps small and mid-sized businesses achieve faster time-to-value with systems that are affordable, straightforward to maintain, can be implemented quickly, and minimize end-user training. 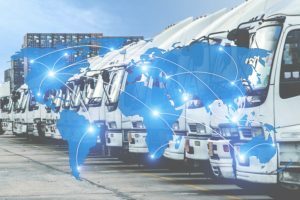 The supply chain is the lifeblood of a business, and knowing where a shipment is at any given time and the condition of the products is a critical part of your business operations. Transportation risks include theft (pharmaceuticals and electronics are top targets), global shipping lane disruptions, cargo lost at sea (maritime law allows a captain to jettison cargo to save the ship), weather, fire, truck and rail accidents, improper storage in third party warehouses, damage to fragile products caused by loading and unloading equipment, and so on. The supply chain risk increases exponentially when shipments require temperature-controlled transportation and storage. According to the Food and Agriculture Organization (FAO) of the United Nations, about 30% of all food produced worldwide for human consumption perishes during transit. These losses do not include damage to other perishable cargo, such as pharmaceuticals, decorative flowers and tropical plants. Cold chain disruptions alone are said to be responsible for $15 billion in product losses every year. Today’s precise IoT solutions enable you to track and monitor your assets across the globe – no matter where they are. SenseIT IoT by Domain utilizes innovative sensors to capture data from around the world, standardizes, consolidates and maintains it in a SAP HANA database in the cloud, and pushes the data to ERP. It gives businesses the ability to quickly locate items globally and alerts them to condition changes. Real-time alerts enable you to address problems related to improper handling before the damage is irreparable. Additional benefits include reducing waste and delays, reducing legal liability, and eliminating disputes over the condition of products upon receipt. SAP HANA is an in-memory relational database management system and application platform that allows for the lightning fast processing of massive amounts of real-time data and generates interactive reports in seconds to help you make smarter, faster decisions. SAP Business One powered by HANA coordinates all resources and systems within your company so that every business function relies on a single database. With a single source of real-time data, the ERP solution breaks up information gridlock and helps your staff make decisions more quickly. Enjoy complete control over every aspect of your shipping operations by integrating SenseIT IoT by Domain for asset tracking and monitoring. Contact Domain Consulting Group at (610) 374-7644 ext. 7005 for a free consultation and demo.